Lucille loves celebrating holidays. And birthdays. Making things for friends, wrapping presents, finding presents. So she always wants to do holiday related crafts. Valentine's Day is no exception. Unfortunately, I'm not the most creative so I'm so thankful for the super creative bloggers out there. Here are some of the fun and creative Valentine's stuff I've found. Eye Like You Valentine: DIY. These are my personal favorite. Of course, Honey-themed ones always get me. Valentine's Day Dot Painting is great for kids hand-eye coordination. The kids love their dotters too. Worksheets. Tracing can keep Lucille busy during Gus' naptime so I love these. I love this easy to make heart bird feeder. So colorful and cute. Not sure that fruit loops are healthy for the birds though... hum. 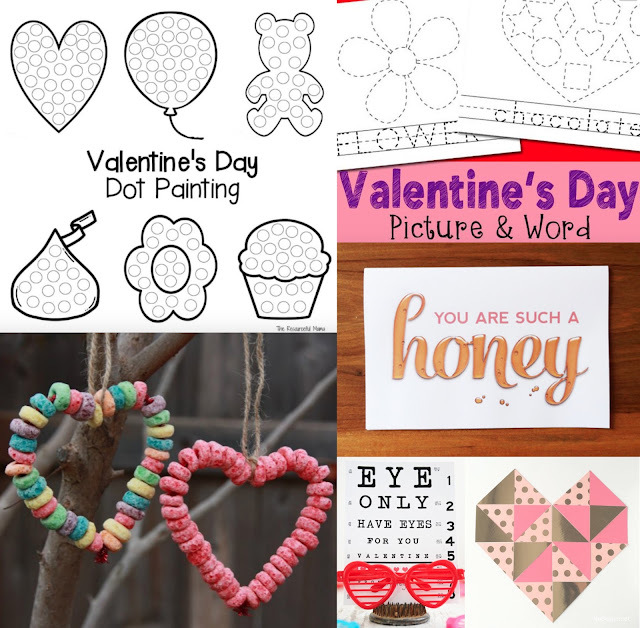 Any favorite Valentine's crafts or printables that you love? Share in the comments?